Evander Holyfield (born October 19, 1962) is an American former professional boxer who competed from 1984 to 2011. He reigned as the undisputed champion in both the cruiserweight and heavyweight divisions, earning him the nickname of "The Real Deal". Holyfield is the only four-time world heavyweight champion, having held the WBA, WBC, IBF, and lineal titles from 1990 to 1992; the WBA, IBF, and lineal titles again from 1993 to 1994; the WBA title from 1996 to 1999; the IBF title from 1997 to 1999; and the WBA title for a fourth time from 2000 to 2001. As an amateur, Holyfield represented the United States at the 1984 Summer Olympics, winning a bronze medal in the light heavyweight division. He turned professional at the age of 21, moving up to cruiserweight in 1985 and won his first world championship the following year, defeating Dwight Muhammad Qawi for the WBA title. Holyfield then went on to defeat Ricky Parkey and Carlos de León to win the WBC, IBF, and lineal titles, thus becoming the undisputed cruiserweight champion. He moved up to heavyweight in 1988, later defeating Buster Douglas in 1990 to claim the undisputed WBA, WBC, IBF, and lineal heavyweight titles. He successfully defended the undisputed heavyweight title three times, scoring victories over former champions George Foreman and Larry Holmes, before suffering his first professional loss to Riddick Bowe in 1992. Holyfield regained the crown in a rematch one year later, defeating Bowe for the WBA and IBF titles (Bowe having relinquished the WBC title beforehand). Holyfield later lost these titles in an upset against Michael Moorerin 1994. Holyfield was forced to retire in 1994 upon medical advice, only to return a year later with a clean bill of health. In 1996 he went on to defeat Mike Tyson and reclaim the WBA title, in what was named by The Ringmagazine as the Fight of the Year and Upset of the Year. This made Holyfield the first boxer since Muhammad Ali to win the world heavyweight title three times. Holyfield won a 1997 rematch against Tyson, which saw the latter disqualified in round three for biting Holyfield on his ears. During this reign as champion, he also avenged his loss to Michael Moorer and reclaimed the IBF title. In 1999 he faced Lennox Lewis in a unification fight for the undisputed WBA, WBC, IBF, and lineal titles, which ended in a controversial split draw. Holyfield was defeated in a rematch eight months later. The following year, he defeated John Ruiz for the vacant WBA title, becoming the first boxer in history to win a version of the heavyweight title four times. Holyfield lost a rematch against Ruiz seven months later and faced him for the third time in a draw. Holyfield retired in 2014, and is ranked number 77 on The Ring's list of 100 greatest punchers of all time. BoxingScene also ranked him the greatest cruiserweight of all time. On September 22, 2007 Holyfield released the Real Deal Grill cooking appliance via TV infomercials. The Real Deal Grill is manufactured by Cirtran Corp.
Holyfield's popularity has led to numerous television appearances for the boxer. His first television show appearance was the Christmas special of the Fresh Prince of Bel-Air in 1990, playing himself. In 2005, Holyfield came in fifth place on ABC's Dancing with the Stars with his partner Edyta Sliwinska. He also made an appearance on the original BBC Strictly Come Dancing "Champion of Champions" showdown, which featured the final four teams from the 2005 edition of the British series, plus two celebrities from spinoff versions, paired with British professional dancers, one featuring Holyfield paired with Karen Hardy, and Rachel Hunter paired with Brendan Cole. Holyfield also had minor roles in three movies during the 1990s, Summer of Sam, Necessary Roughness, and Blood Salvage (which he also produced). He made a guest appearance on Nickelodeon's Nickelodeon GUTSduring its third season in 1994. He appeared once in an episode of Phineas and Ferb. In the episode, he is an animated character but the producers wanted to make the most of Holyfield's ear, so his animated character was only given half an ear. On August 13, 2007, Holyfield was confirmed to participate in a boxing match at World Wrestling Entertainment's Saturday Night's Main Event against Matt Hardy. He replaced Montel Vontavious Porter, who had to pull out after being legitimately diagnosed with a heart condition that was not part of a storyline. In late 2007 and early 2008, Holyfield was among a number of celebrities to be doing television ads for the restaurant chain Zaxby's. Holyfield appeared as himself in the 2011 remake of Arthur. 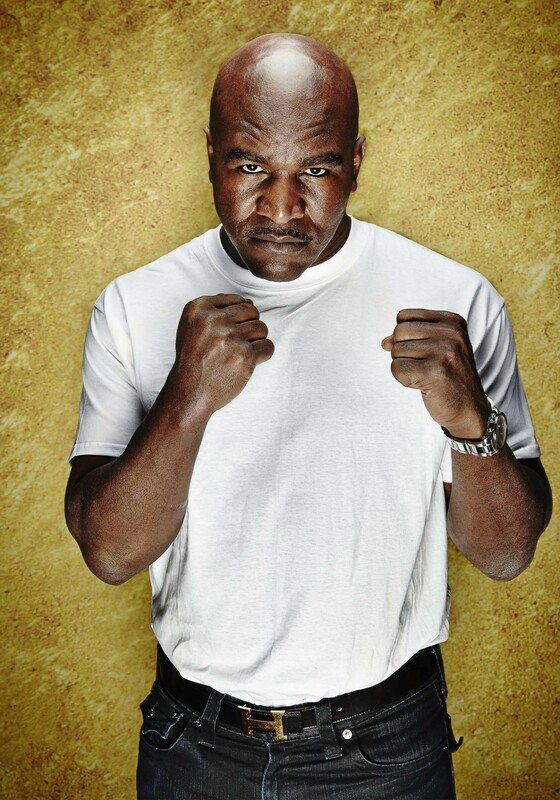 On January 3, 2014, Holyfield became the 12th housemate to enter the 13th series of Celebrity Big Brother (UK). On January 6, 2014, he was reprimanded by the show after saying in a conversation with another housemate that gayness is abnormal and can be fixed. On January 10, 2014, he became the first housemate to be evicted. On May 2016, Holyfield entered the Argentine dancing reality show Bailando 2016.